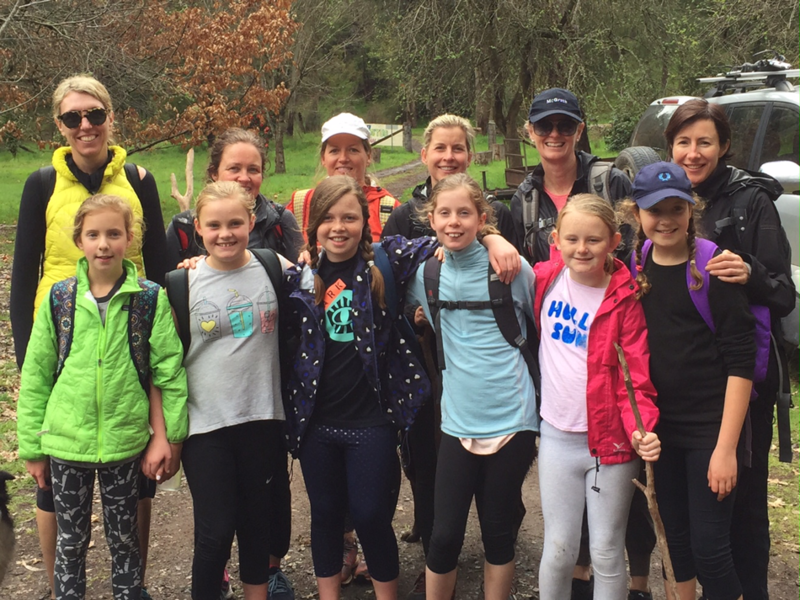 On October 06th, grade 5 Elwood Primary School students Tilly, Eva, Ella, Grace, Mia, and Nellie travelled with their mums up to Howqua Hills Valley in the Victorian high country to go on a 25km hike to raise money for orphaned chimpanzees. 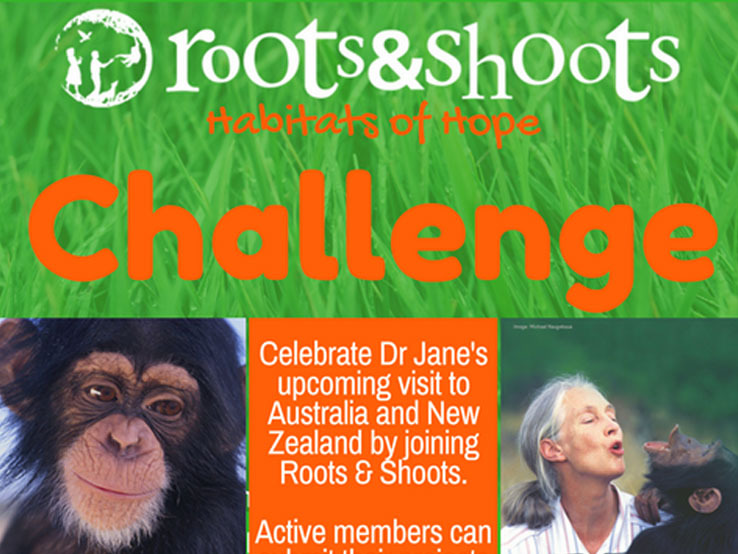 Together they raised over $4000, which will be donated to The Jane Goodall Insitute’s Tchimpounga Chimpanzee Rehabilitation Center in Republic of Congo to help care for injured and orphaned chimpanzees. Below is a recap of their adventure. 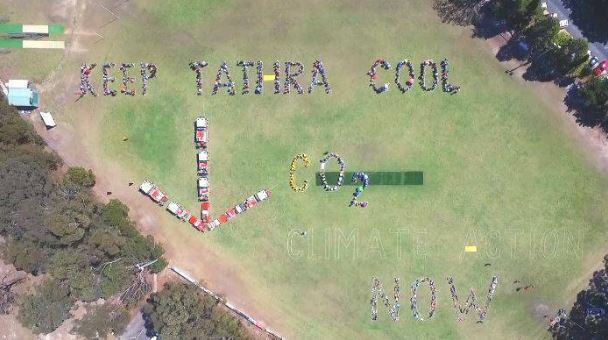 Thank you girls for your amazing effort and for sharing your story with us all! The drive to Howqua is three and a half hours from Melbourne but is totally worth it. There is a windy road just before you get there. 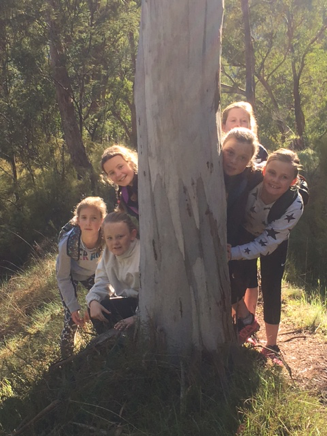 It’s a beautiful sight of trees and native animals such as wombats, wallabies and kangaroos down a gravel road with a few bends in it going down to the base of Mt Buller where Howqua lies. Nigel, the ranger, came before the hike to talk about the native animals and plants, as well as the difference between a national park and a state forest. He told us what to do if we came across a snake and the type of snake we are most likely to come across. Nigel found a rock that the aboriginals had shaped into a tool they had used. The aboriginals came to the Howqua valley in summer to fish and hunt. 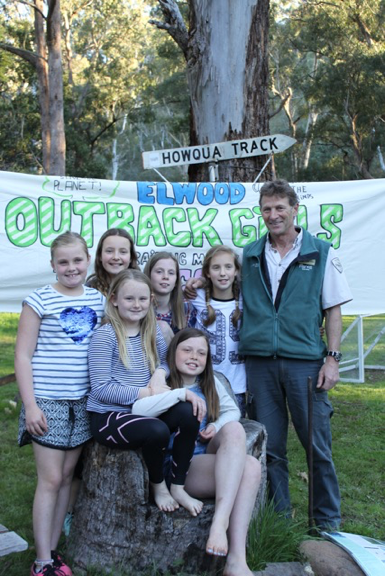 The first night the Elwood Outback Girls (Ella, Eva, Mia, Grace, Nellie and Tilly) slept in a tent. 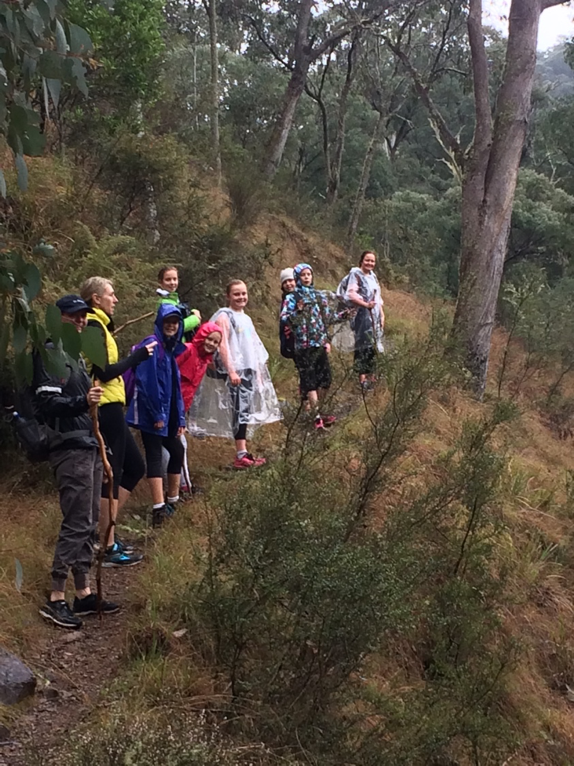 We fell asleep listening to the Howqua river race its way down from Mt Buller. The first morning of the hike we had Weetbix for breakfast. With all the information we learnt from Nigel we were ready for the hike. But it was chilly and it made us a little nervous. As soon as we got to Fry’s Cabin it felt so real. 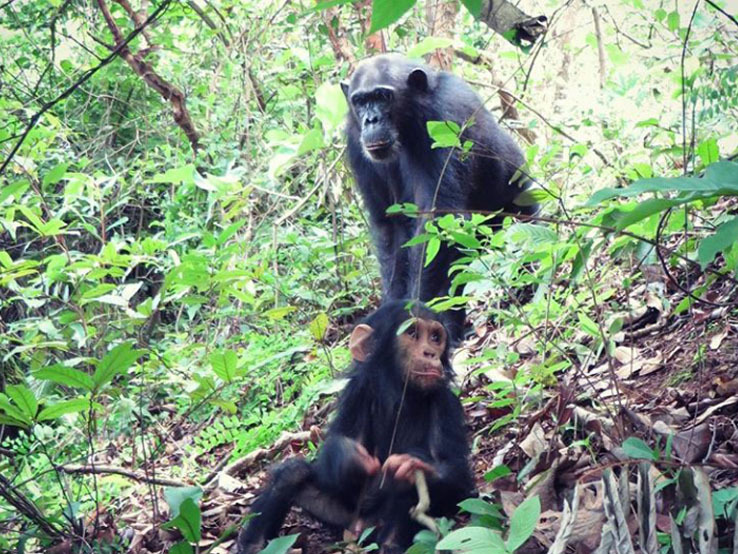 When we started to take the last photos and say goodbyes we took our first steps to victory and to raise money for the chimps…that made me feel proud! Our walk was amazing! 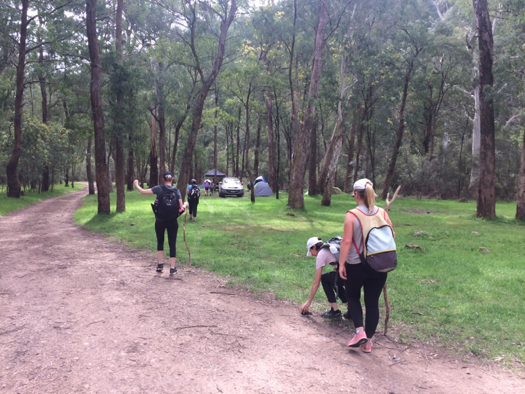 We started off at Fry’s Hut campsite with a bag full of snacks and our lunch. 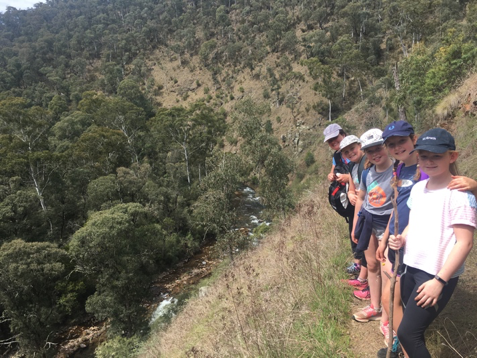 The first day we walked 17km mostly along the high track that follows the Howqua River; the views were stunning. Some of the time we had to walk single file as the track was skinny, with an adult in front watching out for snakes! Jeannine spotted a baby snake and we all sprinted through that spot in case his mum was around. We had a few little breaks and then around 4 hours into our walk we stopped at Gardeners Hut and ate our lunch down by the river. All the kids took their shoes off and put their feet into the icy cold water – it felt good. Back on the track, we reached a small river crossing. The kids made it across no problem, but when it got to Lisa her foot slipped slightly and with all the laughing her whole foot made it in! That was not the end of wet feet. Mum also managed to get a wet shoe by overthinking a river crossing the next day. When we arrived at our campsite after a tiring day of hiking, we put down our day packs and had a lookaround. We were happy to see our tents put up and the drop toilet cleaned. Because it was so hot all the girls went down to the river for a swim. Then we collected firewood and water. 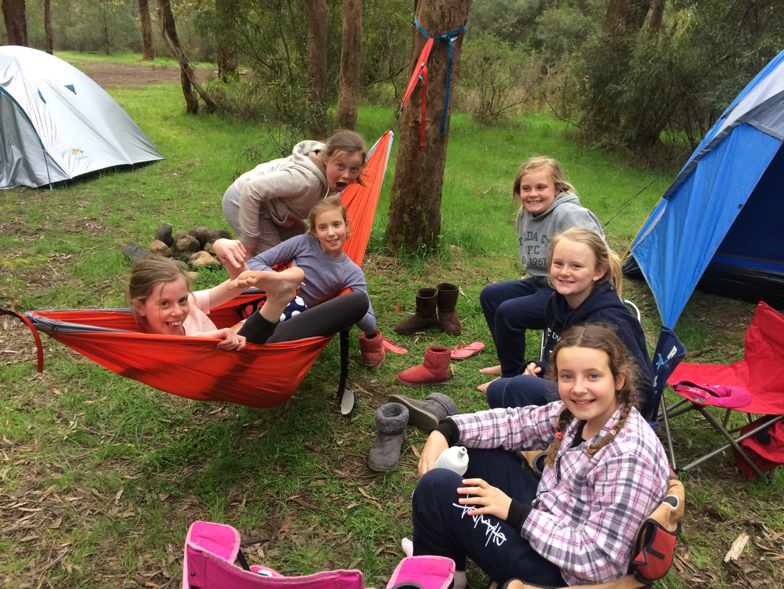 Camping in nature was amazing, but doing it with the Elwood Outback Girls was even better. The hike was huge and to have the Dads to set the camp up was an amazing surprise. We all went down to the river to have a swim, even though it was freezing. As we all made a fire we sat down and had dinner, then we had dessert, which was cheesecake brownies. We were starving. Grace had brought a hammock so we swung on that a lot. The singing of the birds and the rushing river where calming. At night we told spooky stories and looked up at the night sky. There where stars everywhere for there were no city lights. We all slept in little tents with our mums. We all fell asleep ready to walk back home the next day. As we left the campsite, it began to rain so we all put our hoods up and walked on. There were a couple of streams that we had to cross, which were a little fuller and the rocks were slippery, so there were a few falls and some very wet shoes! No matter what, we kept going – even though our legs and feet were sore. 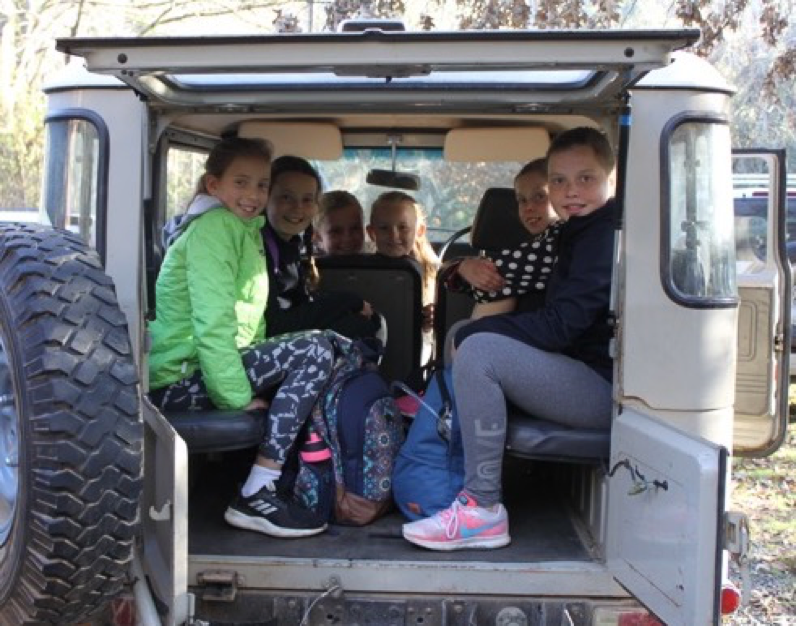 As we walked into base camp, we were so relieved to have made it and very proud of ourselves – we had completed our goal! 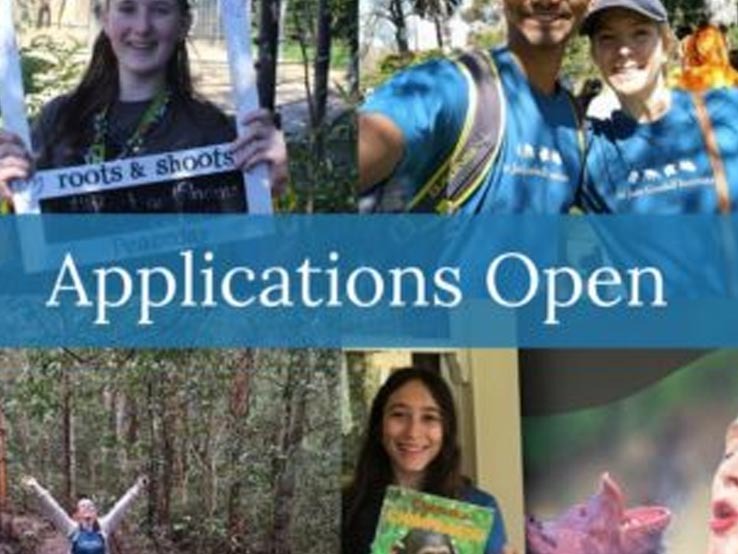 We can’t wait to hear about your next adventure!